It was 18 years ago that Brian Berryman saw his mother, Mary Frances Berryman, die from multiple myeloma, a type of blood cancer. That traumatic life experience helped drive him to become an oncologist at Baylor University Medical Center in Dallas, Texas. Berryman’s efforts to help his patients fight the cruel disease recently motivated him to tackle another feat: Reaching the peak of Mt. Kilimanjaro, the African continent’s tallest free-standing mountain at 19,341 feet. Berryman didn’t do it alone. He and 14 others, a group that includes four patients, formed 2016 Mt. Kilimanjaro Trek – Moving Mountains for Multiple Myeloma. Together they raised $235,333 for the Multiple Myeloma Research Foundation, for research and awareness. Multiple myeloma is the second-most common type of blood cancer and has one of the lowest five-year survival rates of all cancers, Berryman recently wrote on the Multiple Myeloma Research Foundation’s website. Although there isn’t yet a cure, Berryman credited the MMRF with the creation of seven new treatments that have been approved by the U.S. Food and Drug Administration. The drugs have tripled the lifespan of multiple myeloma patients, Berryman said. The MMRF is funding 21 more treatments in various phases of development, giving thousands of patients new hope, Berryman said. 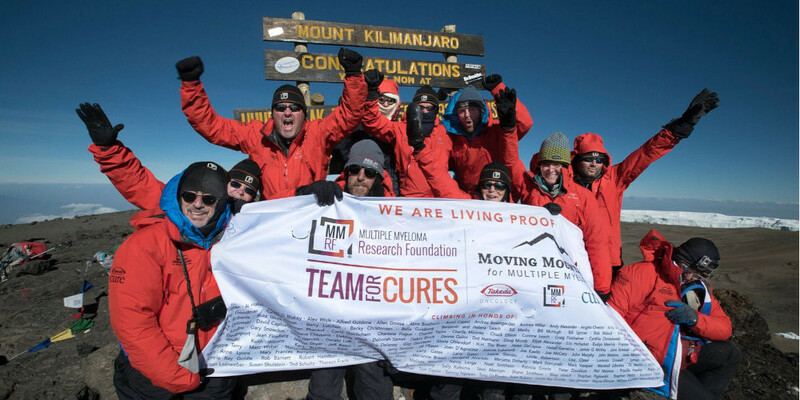 The climbers called themselves “Team Living Proof” because they are living proof that the MMRF and its partners are “curing cancer now.” The team included Berryman’s friend and patient, Dr. Charles Wakefield, a 12-year multiple myeloma survivor. They took nine days to ascend Uhuru Peak, a relatively fast time in light of some of their health conditions. They endured a combined 1.5 inches of rain with a mean temperature of 78 degrees Fahrenheit and average winds of 8 mph. Berryman told NBCDFW.com that the group members did plenty of cardio exercise, running, biking and hiking to prepare for the climb. Improving their endurance was critical to prepare for the decreasing air pressure, which made it harder to breathe in oxygen, as they climbed higher in altitude. To prevent altitude sickness, it was also important to ascend slowly, giving their bodies time to adjust to the changing air pressure. Alicia O’Neill, 56, Santa Barbara, Calif. and Stamford, Conn.: O’Neill works in communications for the foundation. She has run 10 marathons, several of them alongside MM patients, and she said she had dreamed of climbing Kilimanjaro for 30 years. “I can’t imagine anything more amazing than taking on this incredible feat with others who are benefitting from the work that we are doing at the MMRF,” she wrote. Julie Ryan, 44, Camas, Wash.: Ryan’s mother was diagnosed with MM in 2002 but is doing well. “Keeping up the progress of fighting this disease is my sole motivation for this climb,” Ryan wrote. Joining her on the climb was her twin sister, Jana. Mark “Splinter” Harder, 50, Chicago: Harder was the trip’s documentarian, responsible for filming and capturing images of the climb. He wrote that he has had many loved ones suffer different types of cancer, including his mother, sister, grandparents and aunts. He said this project has taught him that there is room in today’s world, with advances in drugs and treatment, for the term, cancer “survivor.” “People get diagnosed, they get treated and they are free to live life having survived that bout with cancer,” Harder wrote. Jeff Levine, 37, Rockville Centre, NY: Although he had no direct connection to anyone with MM, Levine said he has long admired cancer survivors and those who work to develop new treatments and cures. He said he was excited to be climbing his first mountain and making his first trip to Africa.